This web page contains the four pages of the Lorraine Cross newspaper dated April 10, 1919. 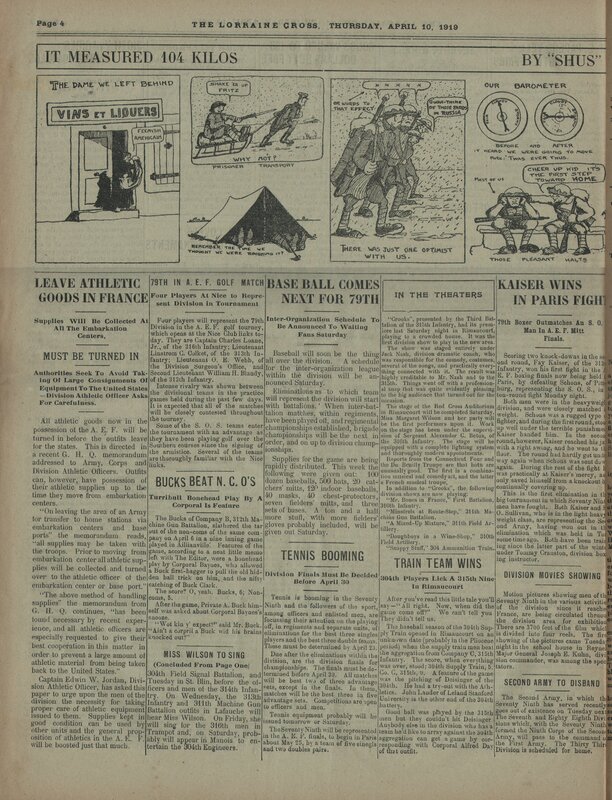 THE LORRAINE CROSS PUBLISHED BY THE 79TH DIVISION Volume 1 ; FRANCE, APRIL 10, 1919 No. ~~ GEN. PERSHING COMES SATURDAY TO REVIEW 79TH MISS WILSON TO SING FOR 79TH Inspection by the Commander in Chief Will Take Place Also. TO GIVE DECORATIONS Dlvlsion All Primed For General' Visit.Everybody Coniident O The Result.Address Probably Will Be A Feature Of Cere u^lo^Die~ ~ Review Blurts At ^rTeu O'Clock. 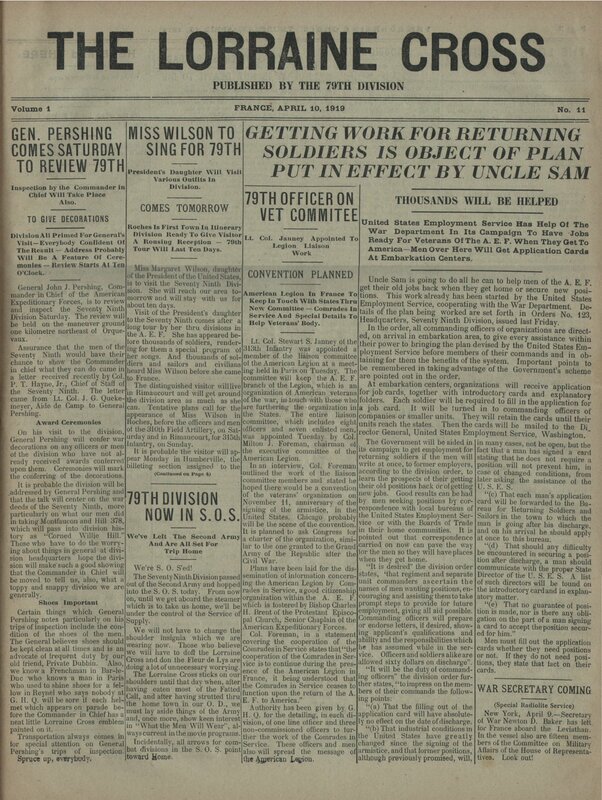 General John J. Pershing, Commander in Chief of the American Expeditionary Forces, is to review and inspect the Seventy Ninth Division Saturday. The review will be held on the maneuver ground one kilometre northeast of Orquevau~. Assurance that the men of the Seventy Ninth would have their chance to shover the Commander in chief what they can do came in a letter received recently by Col. P. T. Hayne, Jr., Chief of Staff of the Seventy Ninth. The letter came from Lt. Col. J. G. Quekemeyer, Aide de Camp to General Pershing. Award Ceremonies On his visit to the division, General Pershing will confer war decorations on any officers or men of the division who have not already received awards conferred upon them. Ceremonies will mark the conferring of the decorations. it is probable the division will be Addressed by General Pershing and that the talk will center on the wa deeds of the Seventy Nintb, mor particularly on what our men di in taking ~ontfaucon and Hill 378, which will pass into division his tory as "Corned Willie Hill.' Those who have to do the worrying about things in general at division headquarters hope the division will make-such a good showing that the Commander in Chief will be moved to tell us, also, what a toppy and snappy division we are generally. Shoes Important Certain things which General Pershing notes particularly on his trips of inspection include the condition of the shoes of the men. The General believes shoes should be kept clean at all times and is an advocate of frequent duty by our old friend, Private Dubbin. Also, we know a Frenchman in Bar-leDuc who knows a man in Paris who used to shine shoes for a fel low in Reynel who says nobody at G. H. Q. will be sore if each hel met which appears on parade before the Commander in Chief has a neatlittle Lorraine Cross. emblem painted on it. Transportation always. cores i for special attention on General Pershing's trips of inspection. ~~U.~ up,,,~, President's Daughter Will Visit Various Outfits in Division. COMES TOMORROW Roches Is First Town In Itinerary Division Heady To Give Visitor A Rousing Reception . 79th Tour Will Last Ten Days. Miss Margaret Wilson daughter of the President of the United States, is to visit the Seventy Ninth Divlsion. She will reach our area toe morrow and will stay with us for about ten days. Visit of the President's daughter to the Seventy Ninth comes after a long tour by her thru divisions in the A. E. F. She has appeared betore thousands of soldiers, rend~ringfor them a special program of her songs. And thousands of soldiers and sailors and civilians heard Miss Wilson before she came to France. The distinguished visitor willlive in Rimaucourt and will get-around the division area as much as she can. 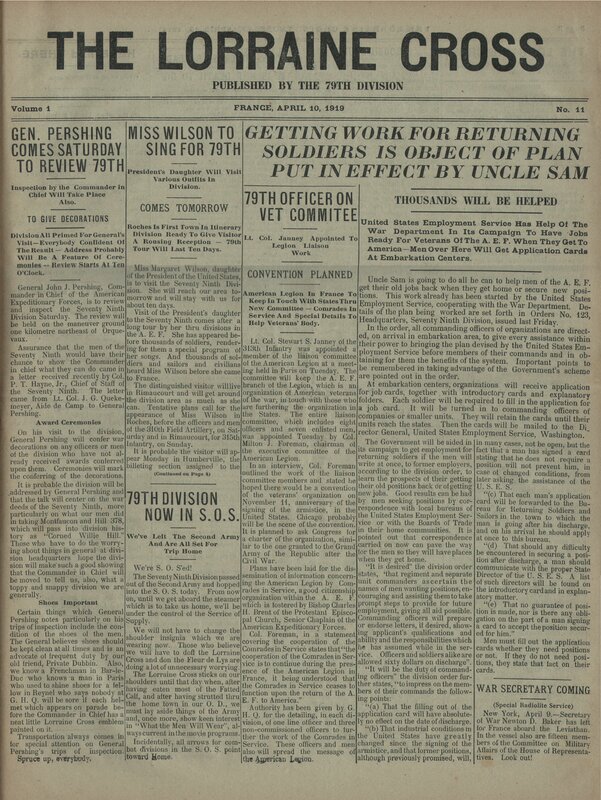 Tentative plans call for the appearance of Miss Wilson in troches, before the officers and men of the 310th Field Artillery, on Saturday and in Rimaucourt, for 3i5th Infantry, on Sunday. it is probable the visitor will appear Monday in Humberville, the billeting section assigned to the (Continued on Page 4) 79TH DIVISION NOW IN S.O.S We've Lelt The Second Arm And Are All Set For Trip Elome We're S. O. S'ed! The Seventy Ninth Division passed out of the Second Armv and hopped into the S. O. S. today. From now on, until we get aboard the steamer which is to take us home, we'll be under the control of the Service of Supply. We will not have to change the shoulder insignia which we are wearing now. Those who believe we will have to doff the Lorrain Cross and don the Fleur de Lys are doing a lot of unnecessary worrying. The Lorraine Cross sticks on our shoulders until that day when, after having eaten most of the Fatted Calf, and after having strutted thru the home town in our O. D., we must lay aside things of the Army and, once more, show keen interest in "What the Men Will Wear", always current in the movie programs Incidentally, all arrows for combat divisions in the S. 0, S. point toward Home. GETT1NG WORK FOR RETURNING SOLDIERS IS OBJECT OF PLAN PUT INEFFECT BY UNCLE SAM 79TH OFFICER ON VET COMMITEE ^ Lt. Col. Ja~ney Appointed To Lesion Liaison - ~ Work CONVENTION PLANNED A~merlcan Legion in Franco To Keep In Touch Wl~h StatesThru New Committee.Comrudes ID Service And Special Details To Help Veterans' Body. Lt. Col. Stev art S. Jangler of the :313th Infantry was appointed a member of the liaison committee of the American LegiDn at a meetin~ held in Paris on Tuesday The committee will keep the A. E. F. branch of the Legion, which is an organization of American veterans of the war, ill touch with those who are furthering the organization in the States. The entire liaison committee, which includes eight officers and seven enlisted men, was appointed Tuesday. by Col. Milton J. Foreman, chairman of the executive committee of the American Legion. In an interview, Col. Foreman utlined the work of the liaison committee members and stated he hoped there would be a convention of the veterans' organization on November 11, anniversary of the sighting of the armistice, in the United States. Chicago probably will be the scene of the convention. It is planned to ask Congress for a charter of the organization, similar to the one granted to the Grand Army of the Republic after the Civil War. Plans have been laid for the disemination of information concerning the American Legion by Comrades in Service, agood citizenshi organization within the A. E. F. which is fostered by Bishop Charle H. Brent of the Protestant Episco pal Church, Senior Chaplain of th American Expeditionary Forces. Col. Foreman, in a statemen l covering the cooperation of th I Comrades in Service states that "th cooperation of the Comrades in Se I vice is to continue during the pees l ence of the American I:egion in France, it bein,, understood that the Comrades in Service ceases to function upon the return of the A. E. F. to America." Authority has been given by G. H. Q. for the detailing, in each division, of one line officer and three non-commissioned officers to iurther the work of the Comrades in Service. These officers and men also will spread the message o ~ Icon ~~ THOUSANDS WILL BE HELPED United States Employment Service Han Help-Of The War Department In Its Campaign To Have Jobs Heady For Veterans Of The A. E. F. Whan They Get To America.Men Over Here Will Get Application Cards At Embarkation Centers. - Uncle Sam is going to do all he can to help men of the A. E:. F. get their old jobs back when they get home or secure new posiions. This work already has been started by the United Statss Employment Service, cooperating with the War Department. Dee ails of the plan being worked are set forth in Orders No. 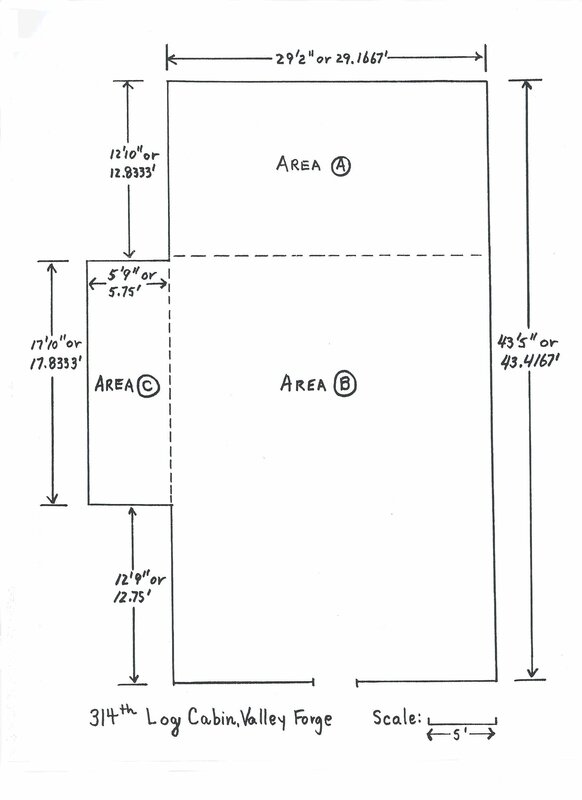 123 Headquarters, Seventy Ninth Division, issued last Friday. In the order, all commanding officers of organizations are directd, on arrival in embarkation area, to give every assistance within heir power to bringing the plan devised by the Gnited States Employment Service before members of their commands and in obtaining for them the benefits of the system. Important points to be remembered in taking advantage of the Government's scheme are pointed out in the order. At embarkation centers, organizations will receive application for job cards, together with introductory cards and explanatory folders. Each soldier will be required to fill in the application for a job card. It will be turned in to commanding officers of companies or smaller units. They will retain the cards until their units reach the states. Then the cards will be mailed to the Di rector General, United States Employment Service, Washington. The Government will be aided in its campaign to get employment for returning soldiers if the men will write at once, to former employers, according to the division order, to learn the prospects of their getting their old positions back or of getting new jobs. Good results can be had by men seeking positions by correspondence with-local bureaus of the United States Employment Service or with the Boards of Trade in their home communities. It is pointed out that correspondence arried on now can pave the way for the men so they will have places when they get home. "It is desired" the division order states, 'that regiment and separate unit commanders ascertain the names of men wanting positions, encoura~ing and assisting them to take prompt steps to provide for future employment, giving all aid possible. Commanding officers will prepare or endorse letters, if desired, showing applicant's qualifications and ability and the responsibilitieswhich he has assumed while in the service. Of Eicers and soldiers alike are allowed sixty dollars on discharge". "It will be the duty of commanding officers" the division order further states, "to impress on the members of their commands the following points: "(a) That the filling out of the application card will have absol~tely no effect on the date of discharge. "(by That industrial conditions in the United States have greatly. changed since the signing of the armistice, and that former positions, although previously promised, will, m many cases, not be open, but the fact that a man has signed a card stating that he does not require a position will not prevent him, in case of changed conditions, from later asking the assistance of the "(c) That each man's application card will be forwarded to the Bureau for Returning Soldiers and Sailorsin the town to which the man IS going after his discharge, and on his arrival he should apply at once to this bureau. "(d) That should any difficulty be encountered in securmg a pow lion after discharge, a man should communicate with the proper State Director of the U. S. E. S. A list of such directors will be found on the introductory card and in explanatory matter. "id) That no guarantee of position 15 made, nor is there any o~igation on the part of a man signing a card to accept theposPam :2 TH-E 1:LOAR~INE CROSS, TEIURSDA~,. 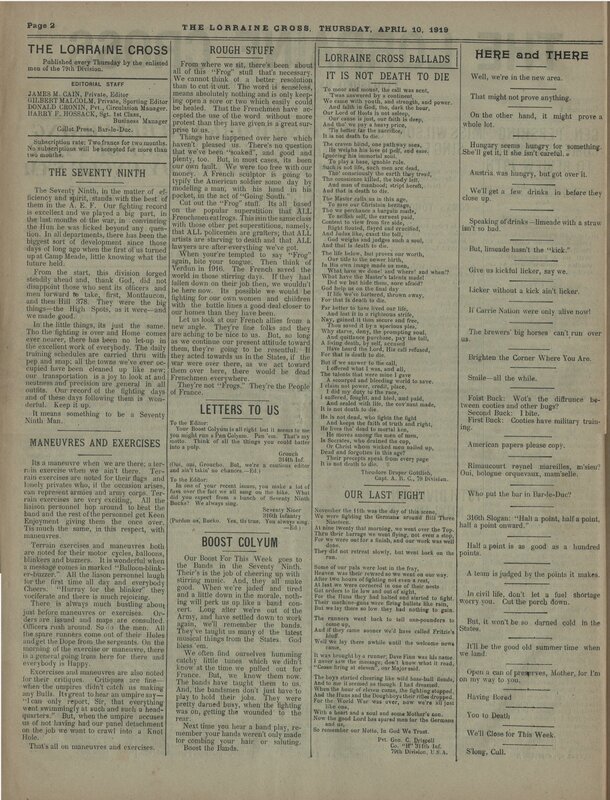 APElIL ~Of $919 ^' ~ ~ ~~ 1 i ^1 '; Vet ~ ' ' ~11 ~~ ~~ ~ ~ ~ AD ~ ', ' ~ _ ~ ~ ~ ~ _ ~ ~ _ _~ THE LORRAINE CROSS | ROUGH STUFF I r LORRAINB CROSS BALLADS I| EWE and WERE Published every Thursday by the enlisted From where we sit, there's been about . ~ meno£the79thDivision. all of this "Frog" stuff that's necessary. 1T IS NOT DEATH TO D E We cannot think of a better- resolution v I EDITORIAL STAFF than to cut it out. The word is senseless, To moor and mount, the call was sent, JAMES M. CAIN, Private, Editor means absolutely nothing and is only keep- Away answered by a continent, GILBERT MALCOLM, Private, Sporting Editor ing open a sore or two which easily could We came with youth, and strength, and power. DONALD CRONIN, Pvt., Circulation Manager. be healed. That the Frenchmen have ac- And laith in God, tho, dark the hour, FIERY F. COSSACK, Sgt. Ask Class, cepted the use of the word without more Our cause ^i^8°~s^u^ts^t^i^S D ^n^ro^t^f^a^sj Business Manager protest than they have given is a great sun- And tho' we pay a heavy price, Co310t Prcss, Bar-le-Duc. prise to ~is. . 'Tis better far the sacriflce^f _ Things have happened over here which It is not death to die. haven't pleased- us. There's no question The craven blind, one pathway sees, that we've been "soaked", and good and Ignoring hi^8 ~^h~^8m^l^o^or^vtea^l^0^8t^o^l^u?^l^l^f~ and ease. plenty, too. But, in most cases, its been To play a base, ignoble role. our own fault. We were too free with our Such is not life, such men are dead, money. A French sculptor Is going to Tho' consciously the earth theytr~ad, The conscience k lad, the bo y sit, typify the American soldier some day by And man of manhood; stript be t, modeling a man, with his hand in his And that is death to die. pocket, in the act of "Goin,, South." The lllas~er calls us in this age, Cut out the "grog" stuff. Its all based To save our Christain heritage, -on the popular superstition that hLL Tbo we perchance a bargain rnade, Frenchmeneatfrogs. Thisisin the same class Content to ^v~^s^e^e^v^l^f~^f^r^o^n^n^e^fi^r^ne~^8^d^paid~ with those other pet superstitions, namely, Righe flouted, flayed and crucified, that ALL policemen are grafters; that ALL And Judas like, exact the toll, artists are starving to death and that ALL God weighs and judges such a soul, lawyers are after everything we've got. And that ls death to die. When your're tempted to say "Frog" The hfe below, but proves our worth, Our ti e to the newer b rth, again, bite your tongue. Then think of In Hi own image made us men, Verdun in 1916. The French saved the What have we done! and where! and whence world in those stirring days. If thev had What have the Laster's talents madel fallen down on their job them we wouldn't Did we but hide them, sore afraid? be here now. Its possible we would be God help us 0 bartered, thrown away, fighting for our own women and children For that is death to die. with the battle lines a good deal closer to Far better to have lived our life, our homes than they have been. And lost it in a righteous strife, Let us look at our Freneh allies from a Nay, gained it thus secure and free, new angle. They're Jine folks and they Thou saved it by-a peeious plea are aching to be nice to us. But, so long And quittance purchase, pay the toll, as we continue our present attitude toward A living death, by self accused them, they're going to be resentful. If blade heard the Lord, His call refused, they acted towards us in the States, if the For that is death to die. war were over there, as we act toward f offered n ^ws^hw^ae^tr^It~ the call, I The talents that were mine I gave A scourged and bleeding world to save. I claim not power, credit, place, I suffered, foi^lg I, and bled, and paid, And sealed with life, the cov'nant made, It is not death to die. He Is not dead, who fights the 11~ht And keeps the faith of truth and right, He lives tho' dead to mortal ken, He moves among the men of men, I8 Socrates, who drained the cup, Or Christ whom wicked men nailed up Dead and forgotten in this age? Their precepts speak from every page It is not death to die. Subscription rate; Two francs for two months. ] No subscriptions will be~ccepted for more than 1 two months. - l - ( THE SEVENTY NINTH ~ ^. . . The Seventy Ninth, in the matter of e~ficiency and spirit, stands with the best of them in the A. E. F. Our fighting record is excellent and we played a big part, in the last months of the war, in convincing the Hun he was licked beyond any question. In all departments, there has been the biggest sort of development since those days of long ago when the first of us turned up at Camp Meade, little knowing what the future held. From the start, this division forged · steadily ahead and, thank God, did not disappoint those who sent its officers and men: forward tie take, first, Montfaucon, and then Hill 378. They were the big things.the High Spots, as it were.and we made good. In the little things, its just the same. Tho the fighting is over and Home comes ever nearer, there has been no let-up in the excellent work of everybody. The daily training schedules are carried thru with pep and snap; all the towns we've ever oceupied have been cleaned up like- new; Chum A.......~ ~~ 1~ ~ . our transportation is a joy to look at and neatness and^rpreeision are .general in all outfits. Our record of the fighting days and of these days following them is wonderful. Keep it up. - It means something to be a Seventy Ninth Man. MANE~VRES AND EXERCISES ^. ^. Its a maneuvre when we are there; a terr:^iin exercise when we ain't there. Terrain exercises are noted for their flags and lonely privates who, if the occasion arises can represent armies and army corps. Ter rain exercises are very exciting, All the liaison personnel hop around to heat the band and the rest ofthe personnel get Keen Enjoy^lne^Dt Giving them the once over Tis much the same, in this respect, with maneuvres. Terrain exercises and maneuvres both are noted-for their motor cycles, balloons blinkers and buzzers. It is wonderful when a message comes in marked "BalIoon-blinker-buzz8r." All the liason personnel laugh forthe first time all day and everybody Cheers. "Hurray for the blinker" they vociferate and there is much rejoicing. There is always much bustling about just before maneuvres or exercises. Orders are . issued and maps are consulted Officers rush around. So do the men. Al tl~e spare runners come out of their Hole c a~id.get the Vope from .the sergeants. On the morning of the exercise or maneuvre, there is a general going from here for there and everybody is Happy. Excercises and maneuvres are also noted for their critiques. Critiques are fine. when the umpires didn't catch us making any Bulls. Its great to hear an umpire say. "1 can- only report, Sir, that everything went swimmingly at such and such a head~arters;'~ Buts when the umpire accuse us ~ not having had our panel detachment on the job we want to crawl into a Knot H~13 Thaw all on maneuvres and exercises. ~~ UV~1 11t~1 tat ~1'~ wu~a De dead Frenchmen everywhere. They're not "Frogs." They're the People of France. ^ LETTERS TO US . To the Editor: Your Bood Colyunn is all right but it seems to me you alight run a Pan COIgU^m. Paw 'em. That's my motto. Think of all the things you coutd batter into a pulp. Grouch 314th Inf. loci, oui, Groucho. But, we're a cautious editor and ain't takin' no chances..Ed.) To the Editor: In one of your recent issues, you make a lot of fuss over file fact we all sang on the hike. What did you expect from a bunch of Seventy Ninth Bucks? We always sing. 5erentv Diner 3i6th Infantry (Pardon us, Bucko. lies, tie true. You always sing. - .Ed.) . .. BOOST COLYUM . Our Boost For- This Week goes to the Bands in the Seventy Ninth. Their's is the job of cheering up faith stirring music. And, they all make good. When we're jaded and tired and a little down in the morale, nothing will perk us up like a band concert. Long after we're out of the Army, and have settled down to work again, we'll remember the bands. They've taught us many of the latest musical things from the States. God bless 'em. We often find ourselves humming catchy little tunes which we didn't know at the time we pulled out for France. But, we know them DOW. The bands have taught them to us. And, the bandsmen don't lust have to play to hold their -jobs. They were pretty darned busy, when the fighting was on, getting the wounded to the rear. Next time you hear a band play, remember your hands wereh't only made for coming Your hair or Acting Boost the Ids. Theo~lore Draper Gottlieh, Capt. A. A. A, 79 Division. ^. , ^. - OUR LAST FIGHT November the 11th was the day of this scene, We were fighting the Germans around Hill Three Nineteen. At nine twenty that mornings we went over the Top. Thru their barrage we went flying, not even a stop For we were out for a finish, and our work we, w~e'i} done. They did not retreat 910~71y, but went back on the run. Some of our pals were lost in the fray, Heaven was their reward so we went on our was After two hours of fighting not even ~ rest, At last eve were cornered in one of their nests Got orders to lie low and out of airgE^It, For U^le Huns they had halted and started to fight Their ma^Ghine-guns were flrin,g bulled like rain, But welay there so low they bad nothing to gain. The runners went back to tell one-pouuders to come up, And if they came sooner we'd have called Fritzie's bluff. Well we lay there awhile until the welcome news camel It was brought by a runner; Dave Finn was lets name I never saw the message, don't know Wnat it read "Cease firing at eleven'', our Mlajorsaid. The boys started cheering like wild base-ball fleshy, And to me it seemed as though I had dreamed When the hour of eleven came, Ihe fightin~,~t~pped, And the Huns and the Doughboys their rites drowsed For the World War *as over, now we're Lust like one, With a heart and a soul and some Bother eon. Now the good Lord has spared men tar the Germa,ps and us, So remember our Motto, in God We Trust. Well, we're in the new area. That might not prove anything. - Qn the other hand, it night pram al Bole lot. . Hungary seen hungry for somehow. She'll get it, if she islet careful. ~ , ~ , Hi. ., at, .. AAastr;a was hungry, but got overit. . ., Well, get a few drinks in before they close up. Speaking Drinks.I}meade with a straw isn't so bad. . _ .. ... · But, limeade hasn't the "Id~,^r~ ., . ,_ - . Give us kickful licker, cay we. - . . Licker without a kick ain't licl~. . , I_ , ^. If Carrie Nation were only alive nova! i... . . ~ The brewers' big horse can't run dyer us. , ' Bri~bteD the Corner Where You Are. . .. Smile.all the while. , ,,;, ~~ ck: Wot^rs the dit~runc-~ tweed booties and other bugs? Secop~l Buck: I bite. Fir~,tl Buck: Cooties have Iriilit~ry training. American papers please copy. Rim~ueo~rt rey^l^lei n~areille~, m'si~u? Oui, bowline or~ueva~x,.ma^In^r~elle. - Who put the bar in Bar-l~c? 316th Slogan: "mall a ~ half appoint half a point onward." _ . .. . Half Point is as God as a hundred points; ^, · . . ~ , . ~ ^. - A team is indeed by the points it makes 1~ civil life, don't let a fuel shod worry you. Cut thy pork Odin. t, ~ won t,be so did ~41d ~ the States. It'll be the good old summer time Whiz we land. ~ ~ ..~.... . Open ~ can of purges, Mother, for I'n On my Ivan to you. I, Its v-- ~ r ~ Having Bored ' - ~ ,, fL You to ~q~ ~ , ^, We'} Close for ~~ meek. _ . it, ~ ~ by. 07 Cam? ^, ' ition secur ed for him." Men must fill out the application cards whether they need positions or not. If they do not need positions, they state that fact on . their cards. WAR SECRETARY COMING (Special Radiolite Service) New York, April 9..Secretary of War Newton D. Baker has left for France aboard the Leviathan. In the vessel also are fifteen teen hers of the Committee on Military Affairs of the House of Representat~v~. I.ook out! GENE ILORR~INE CE~O~!I. THURSDAY, APRtI~ 10, ~910 , ^p?~ U. S. PAPERS TELL OF 79TH AFFAIRS Jour^llals - Getting Inlormation About The Divi~lon From The Lorraine Cross The Seventy Ninth is breaking into the pa pars in the States. Clippings the pa pars in the States. Clippings received in the office of the Lorraine Cross prove this. 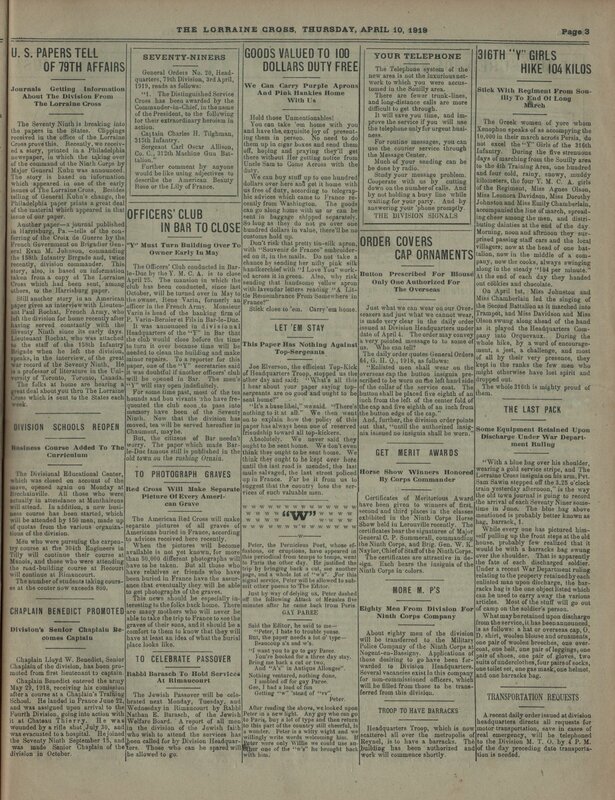 Recently, we receivcd a story, printed in a Philadelphi newspaper, in which the t-a,king over of the command oi the Ninth Corps by Major General Kuhn was announced. The story is based on information which appeared in one of the early issues ot The Lorraine Cross, Besides telling of (3eneral I~uhn's change, the Philadelphia paper prints a great deal uf the material which appeared in that Issue of our paper. Another paper.a journal published in llarrisburg, Pa..tells of the conferring of the Croix de Guerre by the l^! 'rench Government on Brigadier ~eneral Evan M. Johnson, commanding the 158th Infantry Brrgade and, twice recently, division commander. This ~tory, also, is based on information taken from a copy of The Lorraine Cross which had been sent,' among others, to the Harrisburg paper. Still another story in an Arnerica paper gives an interview with Lieute ant Paul Rochat, French Army, wh left the division for home recently afte having served constantly with th Seventy Ninth since its early days. l.ieutenant Rochat, who was attache l to the staff of the 1 58th Infant l Brigade when he left the division speaks, in the interview, of the groa w ar record of the Sere^Dty Ninth, H a professor of literature in the Uni varsity of Toronto, Toronto, Canada. 'l'he folks at home are hearing teat deal about you thru The Lorrain roes which is sent to the States sac . optic. DIVISION SCHOOLS REOPEN sl^l~ess Course Added To The Curriculum 'l'ho Divisional Educational Center, v.hich was closed on account of the uove, opened again on Monday at i'rechainville. All those who were actually in attendance at Monthairons v~illattend. In addition, a new busiue~s course has been started, which will be attended by 150 men, made up of quotas from the various organizatious of the division. Mall who were pursuing the carpentry course at rho 304th Engineers in 'l'illy will continue their course at Manois, and those who were attending the road-building course at Recourt will continue at Rimaucourt. The number of students taking courses at the center now e cceeds 800. CHAPLAIN BEIIEDICT PROllOTED Dlv1610~'6 4e~$or Chaplin leer comes Cnptnlu Chaplain Lloyd W. Benediet, Senior Chaplain of the division, has boon pro~noted from first lieutenant to captain. Chaplain Benedict entered the army May 29,1 ^13~8, receiving his commission after a course at a Chaplain's Training School. He landed in France June 22, and was assigned upon arrival to the Fourth Dirision, going into action with it at Chatoau Thierry. He was wounded by a rifle shot.July 30, and Baa evacuated to a hospital. He joined the Seventy Ninth Septe nber 15, and was made Senior ~::haplain of the di^Yidon in October. SEVENTY-NINEXS General Ordeals No. 20, Headquarters, 7 9th Division, 3rd April, 1919, reads as follows: "1. The-Distingnished Service Cross has been awarded by the Commander-in-Chicf, in the name of the President, to the following for their extraordinary heroism in action. Captain Charles H. Tilghman, 315th Infantry. Sergeant Carl Oscar Allison, Co. C., 312th Machine Gun Battalion." Further comment by anyone would be like using adjectives to describe the American Beauty Rose or the Lily of France. OFFICERS' CLUB IN BAR TO CLOSE GYP' Must Turn Building Over T Owner Early In May The Officers' Olub conducted in Barle-Duc by the Y. M. C. A. is to close April 25. The mansion in which the club has been conducted, since last October, will be turned over in May to the owner, Rene Varin, formerly an officer in the French Army. Monsieur Varin is head of the banking firm of P. Varin-Bernier et Fils in Bar-le-Duc. It was announced in d i v i s i o n a I Headquarters of the "Y" in Bar that the club would close before the time to turn it over because time will b needed to clean the building and mak minor repairs. To a reporter for thi paper, one of the "Y" secretaries sai it was doubtful if another officers' clu will be opened in Bar. The mea' "Y" will stay open Indefinitely. For some time past, most of the te hounds and bon vivants who have fre quented the club soon to pass int memory have been of the Seven Ninth. Now that the division ha moved, tea will be served hereafter i Chaumont, maybe. But, the citizens of Bar needy' worry. The paper-which made Bar l le-Duc famous still is published in th ^1 Id town ou the rushing Ordain. . - ^. TO PHOTOGRAPH GRAVES ^ ed Cros~ WII1 l~lake Separat Plcture Of Every American Grave The American Red Cross will mak l eparate pictures of all graves o l rnericans buried in France, accordin l o advices received here recently. When the pictures will becom l bailable is not yet known, for mor l ban 50,000 different photographs wil ave to be taken. But all those wh ave relatives or friends who bay een buried in France have the assu rice that eventually they will be abl o Ret photographs of the graves. This news should be especially i l cresting to the folks back home. Thor I re many mothers who will never b l ble to take the trip to France to see th l raves of their sons, audit should be l omfort to them to know that they wit l ave at least an idea of what the burls l lace looks like. TO CELEBRATE PASSOVER Rabbi Burasoh To Hold Servlce At Rlmaucourt The Jewish Passover will be eel l rated next Monday, Tuesday an Wednesday in Rimaucourt by Rabb l athan E Barasch, of the Jewis Welfare Board. ~ A report of all me I n the division of the Jewish fait who wish to attend the servicer h eon called, for by Divisioa Head~uar 'err,. ~~ who c&n be sp~re^dwi e allowed to go _ GOODS VALUED TO 100 DOLLARS DUTY FREE We Can ~'arrv Purple Aprons Aud Pink Hankies Home, With Us Hold those Unmentionables! You can take 'em home with you nd have the,e~quisite joy of presentn~ them in person. No need to do them up in cigar boxes and send them ff, hoping and pra ring they'll yet here without Her getting notice from ncle Sam to Corne Across with the ^Ut^Y. We can bu,y stuff up to one hundred ollars over here and get it home with us free of duty, according to telegraphic advises which came to France recentl~ from Washington. The goods can go along home with us or can be sent in baggage shipped separately. So long as they do not go over one hundred dollars in value, there'llbe no customs hold up. Don't risk that pretty tin-silk apron, with "Souvenir de France" embro dered on it, in the mails. Do not take a chance by sending her nifty pink silk handkerchief with "I Love You" worked across it in green. Also, why risk sending that handsome yellow apron with lavender letters reading "A Little Remembrance From Somewhere in France?" Stick close to 'era. Carry 'era home. LET 'EM STAY This Paper Has Nothin^S^I Against Top-Ser~eants Joe Elverson, the efficient Top-Kick of Headquarters Troop, stopped us the other day and said: "what s all this I hear about your paper saying topsergeants are no good and ought to be sent home?" '~It's aba~elihel,"wesaid. "There's nothing to it at al'r." We then went on to explain how the policy of this paper has always been one of reserved friendship tow. ard all top-kickers. Absolutely. We never said they ought to be sent home. We don't even think thee ought to be sent hone. We think they ought to 56 kept over here until the last road is mended, the last mule salvaged, the last street policed up in Frauce. Far be it from us to suggest that the country loss the service^3 of such valuable men. w w w w w w w V w w w w w w w w w rv I w w w w W W W W ~~ W-W W W W W VV W W W W'W W W W W W W Peter, the Pernicious Poet, whose effusions, or eruptions, have appeared in this periodical from tempo to ternps, went to Paris the other day. He justified the trip by bringing back a cut, see another page, and a whole lot of "w'9". ,For this signal service, Peter will be allowed to s~bm~t other poems to The Editor. Just by way of defying us, Peter dashed off the following Attack of Measles five minutes after he came back from Paris. GAY PAREE Said the Editor, he said to me. | "Peter, I hate to trouble you^6e. But, the paper needs a lot o' type. Beaucoup a's and w's. "I want you to go to gay Psree. You're booked for a three day stay Bring me back a cut or two, And "A's" in Antique Allongee". Nothing ventured, nothi-n~ done, 1 ambled off for gay Paree. Gee, I had a load of fun Getting ~'~v" 'stead of "vv". Peter. After reading the above, eve looked upon Peter in a new light. Any guy who can Jo to Paris, buy a lot of type and then return to this part of the country still cheerful, is a wonder. Peter is a witty wight and we willingly write words welcoming bim. I Rater ^! era only Willie we could use anl~r oqe-of the "We'd" he brought back with him. YOUR TELEPHONE The Telephone system of the new area is not the luxuriousuetwork to which you were accustomed in the Shrilly area. There are fewer trunk-lines, and lon~-di~tance calls are more difficult to get through. It will save you time, and improve the service if you will use the telephone onl~for urgent business. For routine messages, you can use the courier service through the Message Center. Much of your sending can be be done by radio. Study your message problem. Cooperate with us bar cutting down on the numberof calls. And by not holding a busy line while waiting-for your party. And by answering your 'phone promptly. THE OlVISION SIGNALS ORDER COVERS CAP ORNAMENTS Button Prescribed For Blouse' Only One Authorized For The Overseas Just what we can wear on our OYC1!ea~ers and just what we cannot wear, s made eerie clear in the daily order ssued at Division Headquarters under date of April 4. The order may convey very pointed message to to some of s. 'who can tell? The daily order quotes Geueral Orders 64, G. H. Q., 1918, as follows: 'Enlisted men shall wear on the overseas cap the button insignia prescribed to be worn on the left hand side of the collar of the service coat. The button shall be placed five eighth of an inch from the left of the center fold of the cap and five eighth of au inch from the button edge of the cap." And, further, the division order Points out that, "until the authorized msignia isc.sued no insignia shall be worn." GET MERIT AWAR DS Elorse Show Winners Honored By Corps Commander C~rti^r^lcate~ nf Meritnrim^lc Award .~ 316TH ~^17 GALS WIKE 104 KILOS Stick Wlth Regiment From SQUilly To End Of Long ~Fch The Grsek women of yore wham 2~enophon speaks of as accompy^Eng the U,000 in their march across Persia, do ot excel the 'BY" Girls of the 314th ufantry. During the five strenuous aye of roarchir^lg from the Souilly area 0 the 4th Training Area, one hundred nd four cold, rainy, snowy, muddy kilometers, the four Y. M. C. L girls f the Regiment, Miss Agnes Olson, Miss Leonora Davidsan, Miss Dorothy ohnston and Miss Emily Chamberhin, c^c^om^paniedthe^l^inedfmar^ch~ spreadnB cheer among the men, and distriuting dainties at the end of the day. Morning, noon and aftrnoon they ^Eurrised passing staff cars and the local illagers; now at the head of one batalion, now in the middle of a coma~y, now the cooks, always swinging long in the steady "104 per minute." At the end of each day they handed ut cookies and chocolate. On April Ist, Mis-s Johnston and Miss Charnberlain led the singing of he Second Battalion as it marched into Trampot, and Miss Davidson and slim Olson swung along ahead of the band s it played the Headquarters Cornany into Orquevaux. During the whole hike, by a word of encouragement, a jest, a challenge, and most f all by their very presences they eptin the ranks the few men.who might otherwise have lost spirit and popped out. The whole 31Bth is mighty proud of them. THE LAST PACK Some Equipment Rdained Upon Discharge Under Wai Department Ruling "With a blue bag over his shoulder, wearing a gold service stripe, and The Lorraine Cross insignia on his arm, Pvt. Sam Sawin stepped off the 3.25 o'clock train yesterday afternoon," is the way he old town^iournal is going-to record have been given to winners of firs^s. ~ . second and third places in the classes exhibited in the Ninth Oorps Horse Show held in Lerouville recently. The certificates bear the signatures of Major General C. P. Summerall, commanding the Ninth Corps, and Brig. Gen. W. K. Naylor, Chiefof Staffof the NinthCor^Ds. The certificates are attractive in design. Each bears the insignia of the Ninth Corps in colors. MORE M. P'S El~l^lty Men From Divlslon For Nlnth Corps Company About eighty men of the division will be transferred to the Military olice Company of the Ninth Corps as ogent-en-Bassigny. Applications of hose desiring to go have been forwarded to Division Headquarters. everal vacancies exist In this company for non-commissioned officers, which _ frill be filled from those to be tran~ferred from this division. TROOP TO HAVE BARRACKS . Headquarters Troop, which is nor scatters all over the metropolis o Reyne^l^7 is to have a barracks. Th 13~ has been ' authorized an work Bill comm~hce shortly. lie arrival OI eacn Seventy Nmer someime in June. The blue bag above entioned is probably better known as ag, barrack, I. While every one has pictured himelf pulling up the front steps at the old ouse, probably few realized that it ould be with a barracks bag swung or the shoulder. That is apparently he fate of each discharged soldier. nder a recent War Department ruling elating to the property retainedbyeacii nlisted man upon discharge, the baracks bag is the one object listed which an be used to carry away the various rticles. Most of the stuff will go out f camp on the soldier's person. Whatmayberetained upon discharge om the sernce, ~ t has been announced, 3 as follows: a hat or overseas cap, O. shirt, woolen blouse and ornaments, Be pair of woolen breeches, one overoat, one belt,one pair of leggings one air of shoes, one pair of gloves, two nits of underclothes, four pairsof socks, ne toilet set, one gas measly, one helmet, nd one barracks bag. - TRANSPORTATION REQUESTS A recent dail:y.orderissued at division headquarter directs all requests for motor transportation, save in azalea, of real emergency will be telephoned to the I)irision M. T. C). bar. P. hi. elf the dater preceding date transports titan is needed. . ~ 1~4 A , : ~ . ' ' . ~ ~ ~ . ~ ' l ' __ _ _ , . . , ,, . , , ~ , , ^. ~ ' ~ " ' ' - -.--em ~ IT MEhSURED 104 KILOS - BY'^C~HUS'' L. . .. . , . SHE ~ME- WE LEFT BE:~1 .~ T. ~ E ~ O R ~ ~ I N E C ~ O Ski, TOUR ;DA~, ~PR71~ 1~, 1818 ~ , . ^. . . . ~ .._. . ~ LEAVE ATHLETIC GOODS IN FRANCE Supplies Wlll Be Collected At All The Embarkation Centers, MUST BE TURNED IN Authorllies Seek To Avoid Takin~Ot Large Consignments Of Equipment To The United States .division Athle^lic Otlicer Asks For Carefulness. All athletic goods now in the possession of the A. E. F. will be turned in before the outfits leave for the states. Thisis directed in a recent G. H. Q. memorandum addressed to Army, Corps and Division Athletie Officers. Outfits can, however, have possession of their athletic supplies up to the time they move from embarkation centers. "On leaving the area of an Army for transfer to home stations via embarkation centers and base · ports" the memorandum reads, "~11 s~pplies-may be taken with the troops. Prior to moving from emba^l kation center all athletic ^st^rpp~ies will be collected and turned over to the athletic officer of the embarkation center or base port." "The above method of handling supplies" the memorandum from A. H. Q. continues, "has been found necessary by recent exper fence, and all athletic officers an Specially requested to give thei best cooperation in this matter i^l order to prevent a large amount o athletic material from being take back to the United States." ~ Captain Edwin W. Jordan, Divi sion Athletic Slicer, has asked this paper to urge upon the men of the division the necessity for taking proper care of athletic equipmen issued to them. Supplies kept if good condition can be useful by other units and the general ^Dro^D osition of athletics in the A. A. ~ will be boosted just that much. I 79TH IN A. E. F. GOLF BATCH Four Players At Nlce to Repress sent Dlvision in Tournament Four players will represent the 79tb Division in the A. E. F. golf tourney, which opens at the Niee Club links today. They are Captain Charles Loane, Jr., of the 316^1^h Infantry; Lieutenant Linstrom C. Colket, of the 313th Infantry; Lieutenant O. 14. Webb, of the Division Surgeons Office, and Second Lieutenant William H. Blaudy, of the 3t3th Infantry. Intense rivalry seas shown between the divisional teams in the practice games held during the past few days. It is expected that all of the matches will be closely contested throughout the tourney. Some of the S. O. S. teams enter the tournament with an advantage as they have been playing golf over the Southern courses Dime the signing of the armistice. Several of the team are thoroughly familiar with the Nice links. BUCKS BEAT N. C. O'S Turribull Bonehead Play By A Corporal Is Feature . The Bucks of Company B. 312th ~achine Gun Batlalion, slathered the ta out of the non-coms of the same com pany on April 6 in a nine inning gam played in ~illianville Fear of ah BASE BALL CO~lES NEXT FOR 79TH Inter-Or~anization Sahedule To Be Announced To Waiting Fans Saturday . ,~. ^. Baseball will soon be the thing all over the division. A schedule for the inter~orga^l^lization league within the division will be ~nnounced Saturday. Eliminations as to which team will represent the division will start with battalions. ' When inter-battalion matches, within regiments, ave beenpiayed oil, and regimental championships established,brigade championships will be the next in order, and on up to division champonships. Supplies for the game are being apidly distributed. This week the following were given out: 100 dozen baseballs, 50 ;} bats, 20 cat hers' mitts, 120 indoor baseballs, 40 masks, 40 chest-protectors, seven fielders' mitts, and three sets of bases. A ton and a half more stuff, with more fielders' gloves probably included, will be given out Saturday. ^~ . Caine, according to a neat little mem TCAI~I~ ~ n n M I Al 1~ Left with 'the Editor, were a bonehead I L 11 1 · l ~ UVVlllll^lU play by Corporal Bayoes, Rho allocate ~ Buek first-bagger to pull the old hid- Divlslon Flnals Must Be Deoided fen ball trick on him, and the nif^l Beiore April 80 catching of Buck Clark. The scorer of yeah. Bucks, 6; Noncoms, 5. After the game, Privale A; Buck him~elf was asked about Corporal Bay^l^les'^6 snooze. "Wot kin y' oY~ecL9~' said Mr. Buck. 'ain't a corpril a Buck wid his brains crocked out?" ^. . ^. MISS WILSON TO SING (Concluded From Page One) ;1E~E 05 J^vsS ~~£ OPT WITH US _. .. ~ .. I I I14 T HE THEATERS 1 . . 1 - _ "Crooks", presented by the Third Bat talion of the 315th Infantry, had its prem iere last Saturday night in Rimaucourt playing to a crowded house. It was the first division show to play in the new area The show was staged entirely uude^l Jack Nash, division dramatic coach, whc was responsible for the comedy, costumes. several of the songs, and practically every: Ring connected with it. The result was highly creditable to Mr. Nash aml to the 315th. Things went off with a professional snap that was quite evidently pleasing to the big audience that turned out for the occasion. The stage ot the Red Cross Auditorium n Ritnaucourt will be completed Saturday. Miss Margaret Wilson and her party will be the first per former s upon it. Work on the stage has been under the supervision of Sergeant Alexander C. Betus, of the 316th infantry. The stage will be equipped with a complete lighting system and thoroughly modern appointments. Reports from the Connecticut Four and the Du Bruillv Troupe are that both are unusually good. The first is a combination musical and comedyact, and the latter a French musical troupe, In ad^(^lition to "Crooks", the followin division shows are now ~laying: "Mr. Bones in France, ' First Bathlion, 316th Infantry. "minstrels at Route-Step," 311th Machine Gun Battalion. "A Mixed-l Mixt^l^lre " 311th Fi,^3]d Ar EAISER WINS IN PARIS F1GH 79th Boxer Outmatches An S. glean In A. E. Y. Ilitt E inals. Scoring two knock-downs in the set ond round, Fay Kaiser, of the 313 Infautry, won his first fight in the E. F. boxing finals now being held Paris, by defeating Schons, Or Pit burg, representing tho S. O. S., in ten-round fight Monday night. Buth men were in the heav~weig division, and were closely matched ' weight. Scho>ns was a rugged type fighter, and during the first round, stop 1^) well under the terrible punishme Kaiser handed hirn. In the seem rvund,however,Kaiser reached his ja with a right swing, and he went to tl our. The round had hardly got und way again when Schons was sent dint again. During the rest of the fight ~ was practically at ~aiser's mercy, al only saved himself from a knockout 1 continually covering up. This is the first elimination in tl big tournament in which Seventy Nin men have fought. Both Kaiser and I O.. Sullivan, who is in the light head weight clause are representing the Se ~ __, _ ~ nr1 A r^lnv h~vi^l~u ~~ · tillers. ~~ a.... "13^Oughboy^3 in a Wine-Shop," 310th Field Artillery. "Snappy Stuff," 304 Amm^lmition Train. TRAIN TEAM WINS South Players Liek A 815th Nlne In Rimaucourt Tennis is booming in the Seventy Afteryou'veraadthislittletaleyou'll Ninth end the followers of the sp^Ort~^!^sa^y." AIL right. Now, when did the among officers and enlisted men, are focussing their attention on the Baying aft, in reg,i^l^l^lents and separate u,uits, of eliminations for the best three singles players and else best three double teams. These must be determined by April 23. game come oft~!75 We can't tell you They didn't tell us. The baseball season of the 304~h Supply Train opened in Rimaucourt on an unknown date (probably in the Pliocene periods when the supplely train men beat Due after the eliminations within ^Ihe ^L^l e ae~r^A~.i~ from l~.~nn~nv n at Al, division, are the division finals for . ~hampionsbips. The finals must be de3^01th Field Signal Battalion, and ermined before April30. 6^1lma^lches Tuesday in Sty Blin, before the of ... fleers and men of the 314th Infan try. On Wednesday, the 313t~ Infantry and 311th Machine Gu Battalion outfits in Lafauche wi] hear Miss Wilson. On Friday she will sing for the 316th men it Tranapot and, on Saturday, probe ably will appearin J~Ianois to en ertain the ~4tbh Earners. . Wlll De D^e^gt two 0~ three advantage sets, except in the finals. In them . matches will be the best three in five l advantage sets. Competitions are open l to officers and men. l Tenais equipment probably will be issued tomorrow or Saturday. The~eventy Ninth will be represented . in the A. lo. if. finals, to begin in Paris about May 25, by a team £ .tiv~ ~inegls and two doubles pairs. ~ CI D -.C ~ wet ~ ~ V ~ ~ infant^ly. l he score, when everything was over, stood; 304th Supply Train, a; Co. C, sloth, U. Afeature~fthegame was the pitching of Deisinger of the 304th. No had it try-out with the A~hLetics. John Lander of Leland Stanford ^IJ^Dirersi^ly is the other end of the 304th battery. (food ball was preyed by the 315tb nen but they couldn't hit Deisinger. Anybody else in the division who has a eam ~~ like to array against the Cloth ~greg&~iou can get a game by corn esponding Title (Corporal Alfred D.ay that outfit. ~ ~ two ~~ UUb 111 ~~ elimination which was held in To some time ago. Buth have been trai ling since the latter part of the mint under Tommy Cranston, division ho: ing instructor. . . DIVISION MOVIES SHOWING Motion pictures showing men oftl Seventy Ninth in the various activiti of the division since it reach France, are Doing circulated thruo the division area for eshibitio There are 3700 feet of the film whit is divided into four reels. The fir showing of the pictures came Tnesda night in the school house in Reyn~ flavor General Jossph E. Kuho, div ion co nmandcr, was among the sped tutors. .. .. SECOND ARMY TO DISBAND The Second Army, in which to Seventy Ninth has served recently goes out of existence on Tuesday nes The Seventh and Eighty Eightfi Div stone which, with the Seventy Nint] formed the Ni^l^lth Corps of the Secon Army, will pass to the command l the First Army. The Thirty Thi DiYii3i(~ ill scheduled for home.